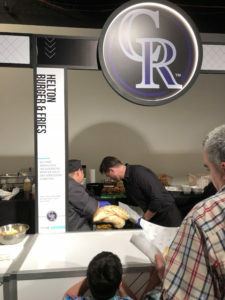 Last weekend, MLB hosted it’s first ever Food Fest, an organized event where all 30 MLB teams participated and served samples of some of the staple foods from their ballparks as well as some sample beers. 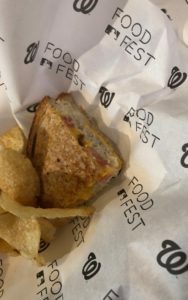 Given our love for both food and baseball, my wife and I went to the event. 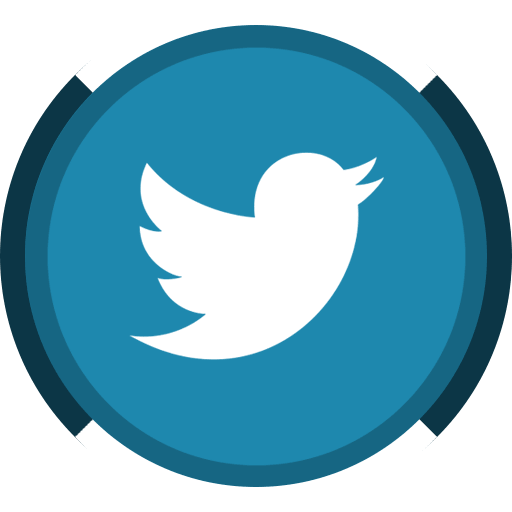 Below are each item, ranked from worst to best. Justin: I know this item is selling like hot cakes at Safeco Field, but I just didn’t have it in me to try an insect. Sorry, we skipped this one. Brigitte: I told Justin like seven times that I wasn’t eating a bug. Justin: Unlike the namesake, this burger was not a home run. It’s a burger with cheese, 1000 island dressing, pickles, onions and Worcestershire sauce. 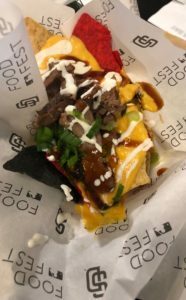 Not a terrible dining option, but it just lacks originality from a ballpark that has apple pie nachos, brisket melts and Rocky Mountain oysters. Brigitte: I forgot to take a picture of this burger, it clearly wasn’t very memorable. Justin: Just like they tend to do on the field, the Mets screwed this up. 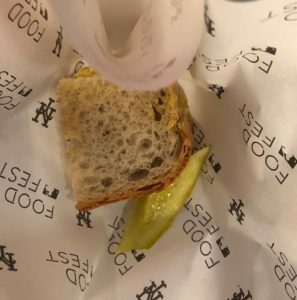 The sandwich was doused in mustard and any New Yorker knows that the key to a good pastrami on rye is a solid mustard-to-meat ratio. Brigitte: How do you screw up pastrami on rye in New York? You let the Mets make it. Justin: Despite having jerk in it’s title, you really don’t taste the jerk seasoning (maybe they’re just named after Jose Bautista). Either way, it just tastes like nachos you could get during happy hour at TGI Friday’s. Nothing spectacular. Justin: To me, baseball food is basically a smorgasbord of foods you would typically eat when you’re drunk. Sometimes they work, sometimes they don’t. In this case, the Cardinals whiffed on this one as there is just a bit too much going on here. Brigitte: I thought the original Nathan’s was in Coney Island? Regardless, I’ve had a better hot dog at a Brooklyn Cyclones game. Justin: It’s not necessarily a bad dish. it’s just something I would never order at a ball game. Though it is fitting to have a Japanese dish on display the same year after they signed Shohei Ohtani. Brigitte: I just didn’t like it. Justin: For the record, lamb is a significantly better selection for shawarma meat than chicken. 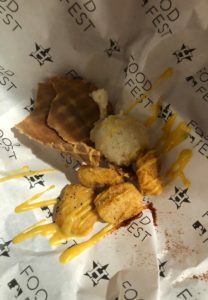 Overall this dish wasn’t bad and I give the Tigers points for originality, but it just doesn’t tie together as well as you would expect. Brigitte: This wasn’t shawarma or nachos. Why were there pickles on it? Justin: Chicago dogs are available all over Chicago, so this isn’t exactly a unique menu choice. 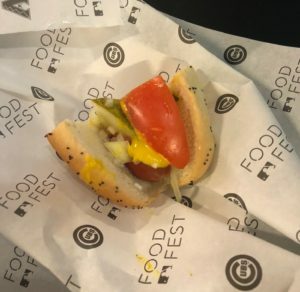 Regardless, hard to go wrong with the Chicago dog and the Cubs didn’t try to be cute or “innovative,” they only used the ingredients that actually go into the dog. 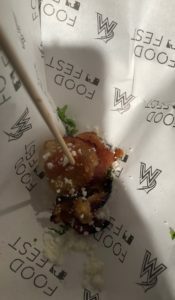 Brigitte: This bite was about on par with the Chicago dogs I’ve had during previous trips to Chicago. 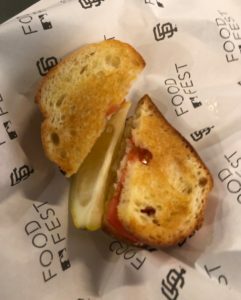 Justin: The sandwich itself isn’t bad, and the Yankees truly don’t have a signature dish at the stadium (unless you count buckets of chicken sandwiches with french fries). It’s simple, and gets the job done, but doesn’t quite stack up compared to the other foods on this list. Brigitte: I think it would have been better if they served a bucket of chicken with fries … and maybe some BBQ sauce. 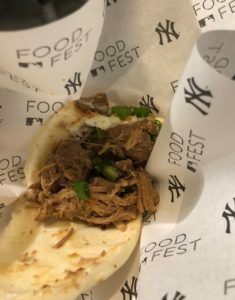 That being said, it was still a somewhat yummy bite, just not what I think of when I think of the Yankees. Justin: I took some points off for the deceitful title. When I hear seaside market, I expect seafood nachos. 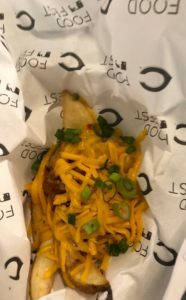 The nachos themselves aren’t bad (and the meat was good), but it lacks the wow factor of the other dishes we had. Brigitte: Sliced steak, on top of nacho cheese, on top of chips. I probably would have liked these nachos more after a few more beers. 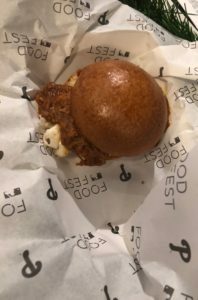 Justin: The pork slider, named after former Phillies outfielder Greg “The Bull” Luzinski, isn’t a bad dish, but Tony Luke’s cheesesteaks or Chickie and Pete’s crab fries are superior dining options in Philadelphia and would have been better represented here. Brigitte: I definitely asked Justin a few times which team offered this slider. Why a pork slider when you are the homeland of the cheesesteak? 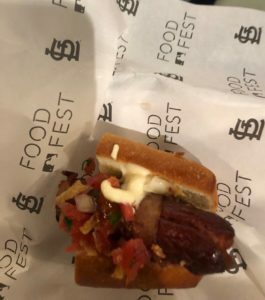 My confusion aside, the pork slider was OK.
Justin: This is peak drunk food and definitely something I would order at the stadium with the worst name in all of sports. Sausage, cheese, fries, garlic toast. 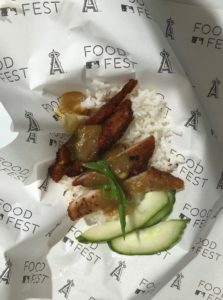 You can’t go wrong with this dish, but this is baseball and there are an abundance of pork dishes that simply did it better. On the plus side, the White Sox are ahead of the Cubs for once. Brigitte: I didn’t even know how to eat this thing. 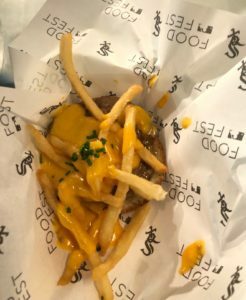 After I figured out how to pick up the globby mess, one bite was more than enough of what was basically fake meat covered in fake cheese and some stale fries. Justin: The dish sounded better on paper, but just couldn’t live up to the hype. I didn’t dislike it, but I wasn’t as in love as I was hoping I would be. Brigitte: This is the turning point for when I started liking the food more. Mac and cheese with pork rinds in a crispy shell? Yeah, definitely the turning point. 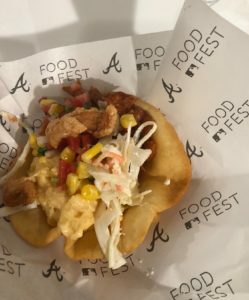 Justin: The crab sandwich was delicious, but what holds it back is simply the fact that it wasn’t even the best crab sandwich available at Food Fest. It is definitely a sandwich I can see myself order while watching Madison Bumgarner toss a gem. Brigitte: The crab on the sandwich was surprisingly light and fresh and was (also surprisingly) what caused this to be the lowest ranked crab item on the list. 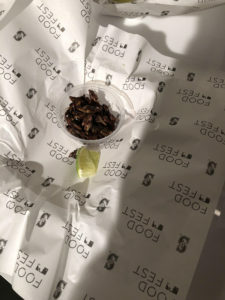 At an event meant to be about over-indulgence, this, albeit yummy bite, didn’t really fit in. 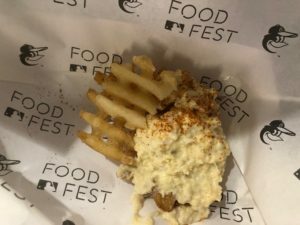 Justin: The Chipper is a far superior dish at Camden Yards and it is slightly upsetting that Natty Bohs weren’t included among the beer selection, but crabmeat and Old Bay seasoning piled on top of waffle fries really isn’t something you can do wrong. It’s an excellent side dish, but it is just a side dish, not a full course, which hurts it’s overall ranking. Brigitte: I took a bite even before snapping the picture. Yum. Justin: A simple, yet classic dish. Potato wedges, cheese, bacon, gravy and scallions. But the dish suffers from the lack of originality and the fact that it is a side dish. I was also looking forward to some Skyline Chili. Brigitte: Cheese, bacon, gravy and scallions on a crispy potato wedge = perfect bite. Justin: This was a delicious dish that started off as savory, but out of nowhere was spicy, thanks to the dusted Flamin’ Hot Cheetos. It suffers a bit from being just a side dish. 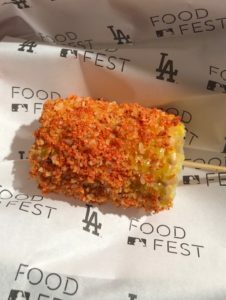 Brigitte: This was a fun and spicy twist on elote. I’m definitely a supporter of putting Flamin’ Hot Cheetos on more things … and I’m not even a hipster. 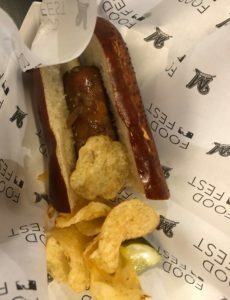 Justin: Of course, Milwaukee had to offer beer brats and it was delicious, complete with a pretzel bun and chips. Only thing missing is beer. 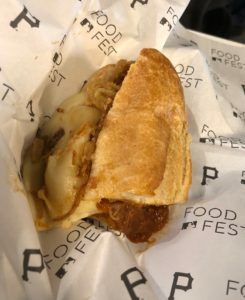 Brigitte: The pretzel bun to brat ratio was definitely off, but it was still a good bite when the brat and onion jam came together and the extra bread was tossed aside. Justin: This carb overload is filled with ambition and a nice nod to the Easter European culture in Pittsburgh. I love pierogies, I love pulled pork and I love hoagies and the three are a match made in heaven. Brigitte: Carb overload is an understatement and this might be an example of too much of a good thing. I love pierogies and I like pulled pork sandwiches, but that doesn’t mean they should be combined. Justin: Getting a sample was great, because I am not paying $30 for a lobster (lobstah?) roll at Fenway. It was a delicious treat the encompasses everything about the city’s seafood life, but is lacking in ambition. 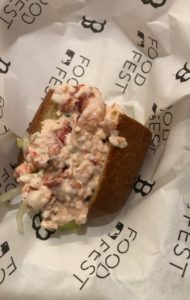 Brigitte: This was a solid sampling of a lobster roll. Plenty of lobster, no celery or other fillers, no complaints. 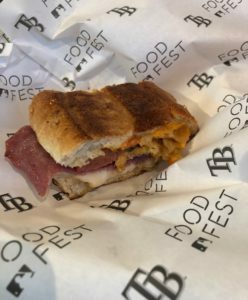 Justin: As someone who doesn’t care for ham, replacing it with corned beef was an excellent and risky move on a classic sandwich that paid off. 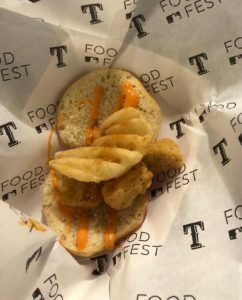 The 47 people who attend Rays games have a great staple dish. Brigitte: I’m a big fan of Cubans and this twist on the classic was delish. The bread was super crisp and stuffed with the right amount of meat, pickles and mustard. Overall, one of my favorites. Justin: This is the crab dish that outshone the Giants. The bread was nice and buttery and the Nationals Earned Run Ale IPA was a great beverage to go alongside. It did, however, need some more Old Bay seasoning, but let’s be honest, there’s no such thing as enough Old Bay. Brigitte: Cheese and seafood doesn’t normally go together … eh, who am I kidding, I put cheese on everything. Melted cheese only makes it better. 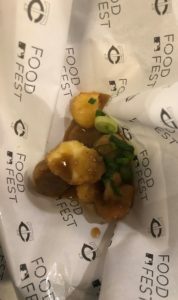 Justin: Bratwurst, cheese curds and gravy is just an incredible combo and even more peak drunk food. This is baseball food is the best thing to happen to the Twins since Joe Mauer. 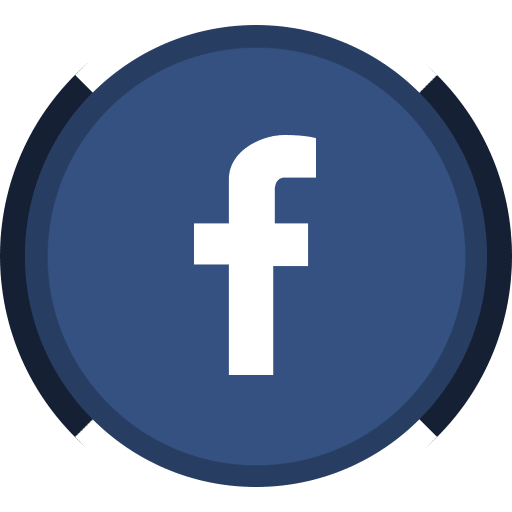 Brigitte: I loved the cheese curds, I liked the gravy, and the bratwurst was just OK. The takeaway, more cheese. Justin: I have to give the Astros extra points for presentation as it looks like an ice cream dish. Drizzling honey mustard on the dish was a nice touch as well. Definitely something to look forward to the next time I go to Minute Maid Park. 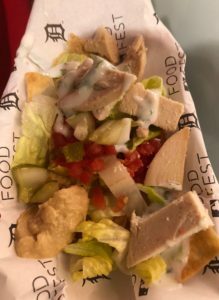 Brigitte: I had a little bit of plate envy on this one since I saw other people with whole cones stuffed with mashed potatoes and fried chicken bites and I got more of the deconstructed version. Plating aside, every element was yummy and was even better when put together. Justin: With a pitching staff full of guys who can bring the heat, this sandwich stacks up. 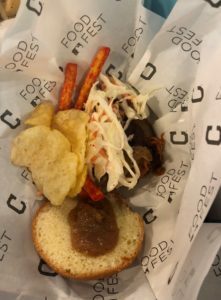 Stuffed with bacon jam, pulled pork, pork belly, BBQ, mayo, cole slaw, Flamin’ Hot Cheetos, green apple and chips, this sandwich is a delicious and spicy mix that goes best with a light lager. Brigitte: This was a big bite, but once I was able to get it all put together, it was awesome and very messy. Also, although a repeat comment, it doesn’t make it any less true – Flamin’ Hot Cheetos needs to be on more things. Justin: This is literally the best Monte Christo is have had since Bennigan’s was still a thing. 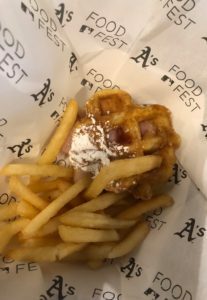 The waffle bun is a great addition and the ratio of the meat and jelly was perfect, plus the saltiness of the french fries balanced the sweetness of the sandwich. Justin: It’s a side dish, but it was both unique and encompassed Miami’s Cuban culture. Definitely the best part about the Marlins now that every relevant player (aside from J.T. Realmuto) has been traded. Brigitte: This was a perfect bite … sweet plantain and salty bacon. What more can a girl want? Oh yeah, there was cheese on it! 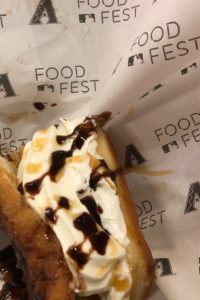 Justin: The only team who brought a dessert dish, the Diamondbacks did it right with their unique twist on the hot dog. Churro, ice cream, whipped cream with chocolate caramel inside a glazed donut. This is a diabetic shock, but well worth it. Brigitte: I don’t know if the bun (which was apparently a donut?) actually added anything other than buzz, but the churro with ice cream was on point and a great bite. Justin: These were nachos done right. Brisket, beans, corn and cole slaw that tied together Kansas City’s great BBQ culture. I am pretty upset that I will not be in Kansas City in the near future. 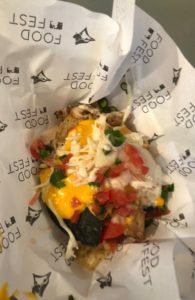 Brigitte: As a self-proclaimed nacho connoisseur, these were great. 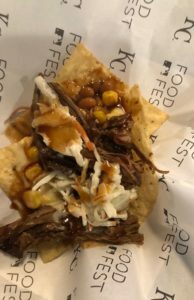 Even with all of those toppings, the nachos weren’t the least bit soggy and the flavors paired very well together. Overall, one of my favorite offerings. Justin: This dish is an improvement upon the traditional chicken and waffles, with a nice touch from the buffalo ranch. It’s sweet, savory and spicy all in one. Brigitte: Fried chicken on a donut is not a unique concept, but this was one of the better executed versions I have tried. 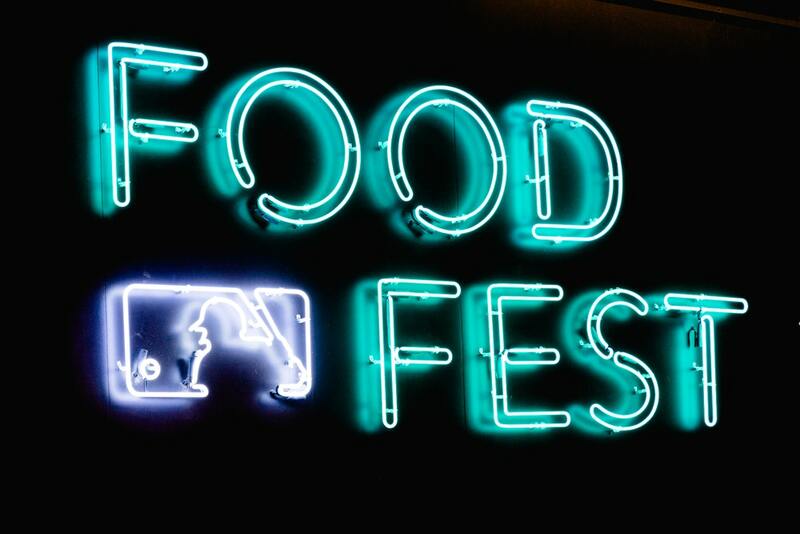 Definitely one of the highlights of Food Fest event with its combination of sweet, salty and spicy. I’m already looking forward to next year!